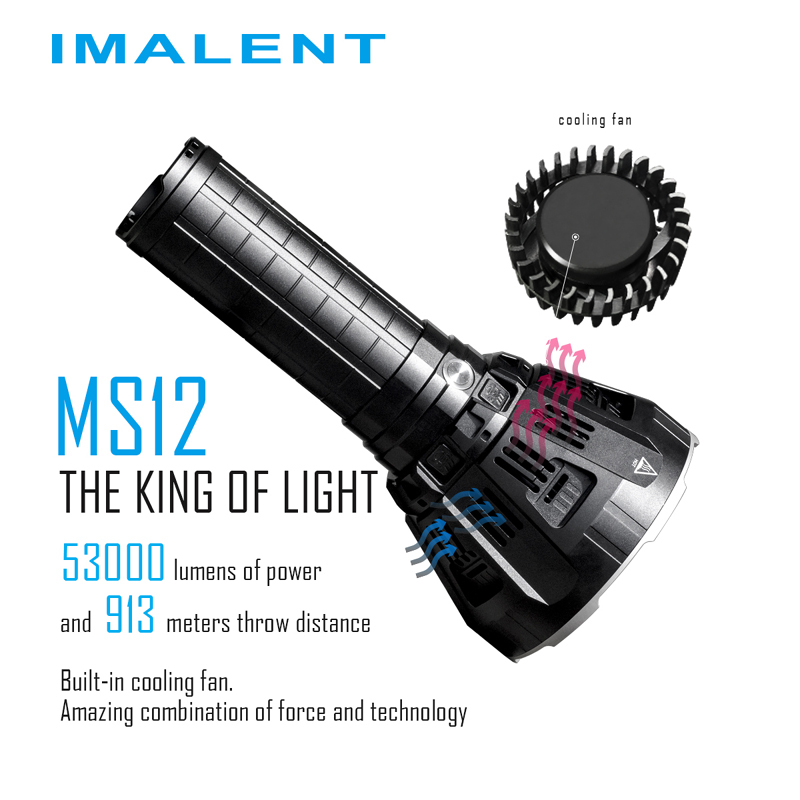 (1) MS12, “Light of the king”, utilizes12 pieces of American CREE XHP70 LEDs with a maximum output up to 53000LM and long throw up to 913 meters, MS12 will bring you absolute shock in the night. 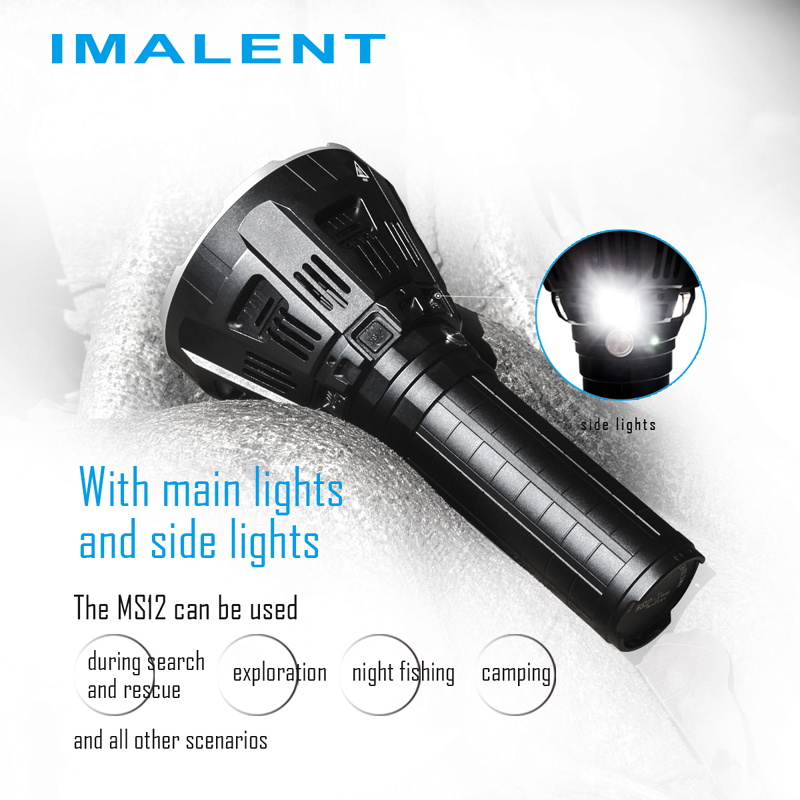 (2) MS12 is extremely compact and comfortable to hold, and utilizes 6 side lights for camping, fishing and more other outdoor lighting experience! 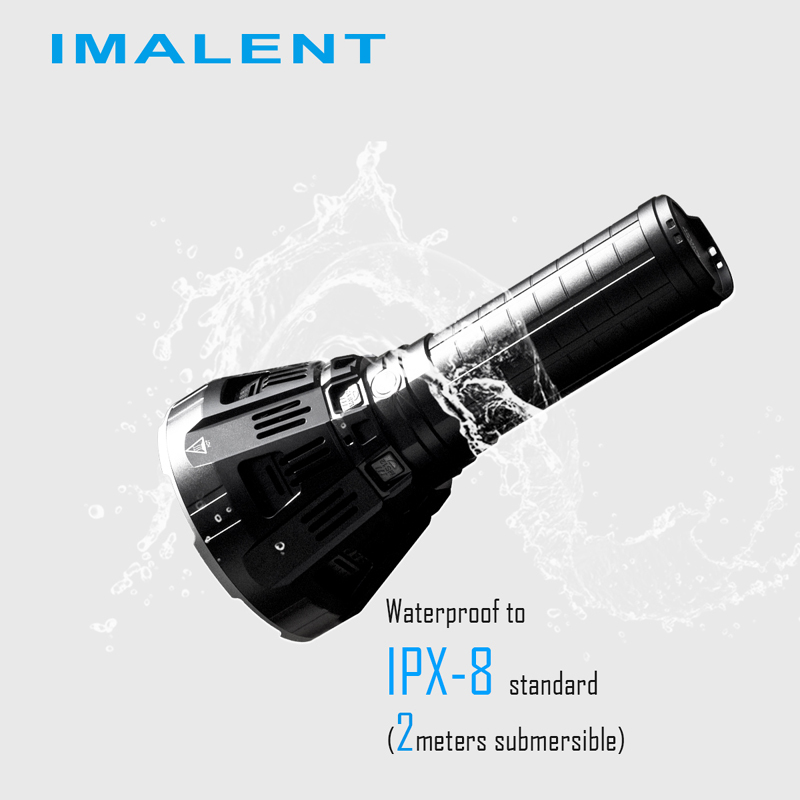 (3) Built in high power cooling fan, silent, waterproof, heavy wind, which is a perfect combination of great energy and technology. 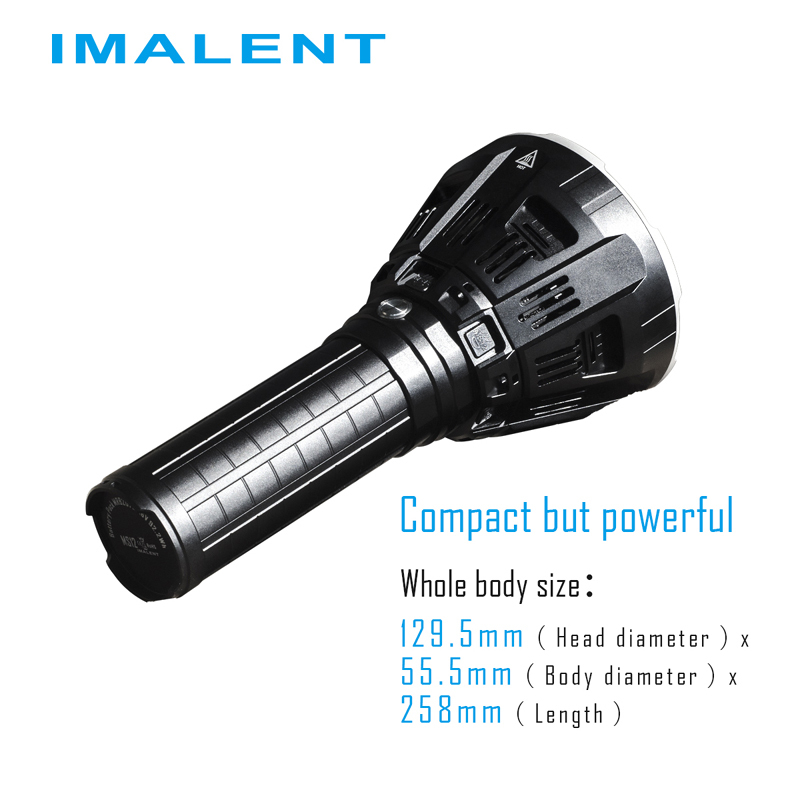 (4) With IMALENT’s unique design with bright plating process optical reflector and 12pcs CREE XHP70 LEDs, the MS12 delivers a maximum output up to 53000 lumens and a far reaching distance of 913 meters, push you boundaries day and lights, make it a perfect search and rescue flashlight! 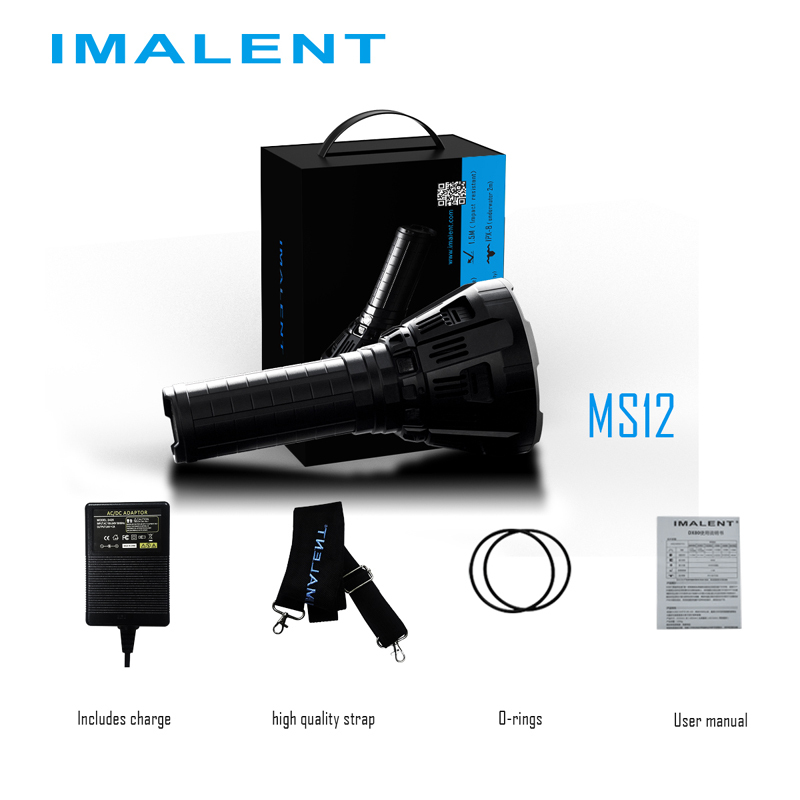 (5) The MS12 features IMALENT’s signature high-grade side pressure switch. 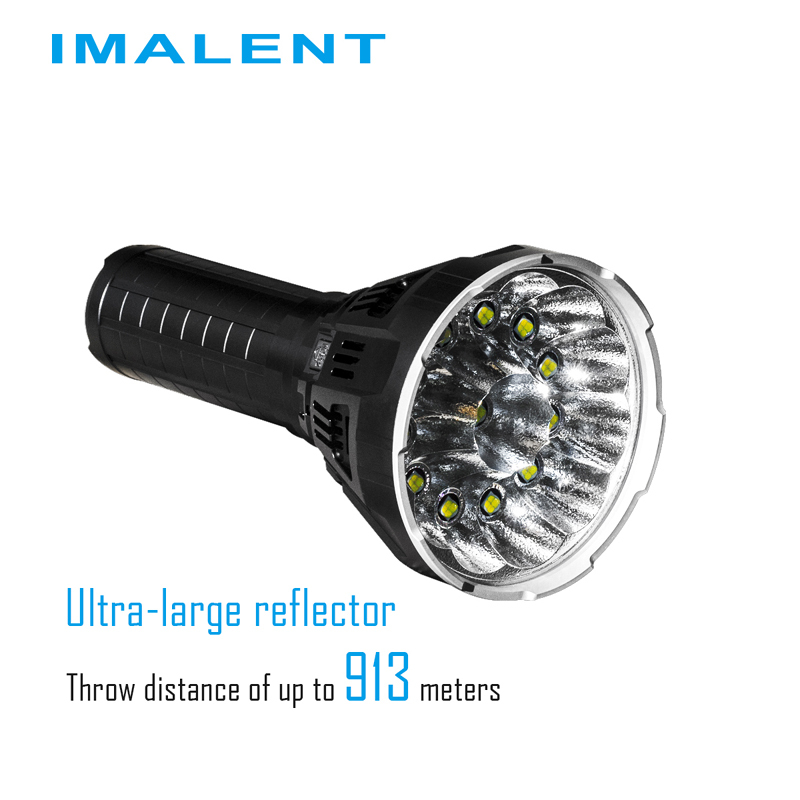 This ergonomic design provides an unprecedented level of grip. 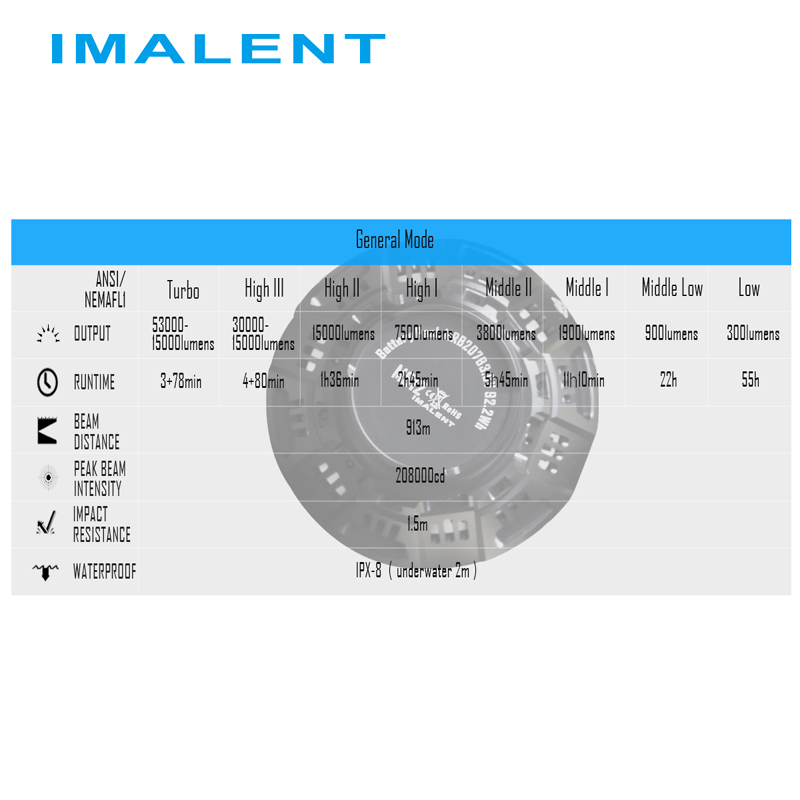 Eight output levels ensure long runtimes with low or high output in any situation. 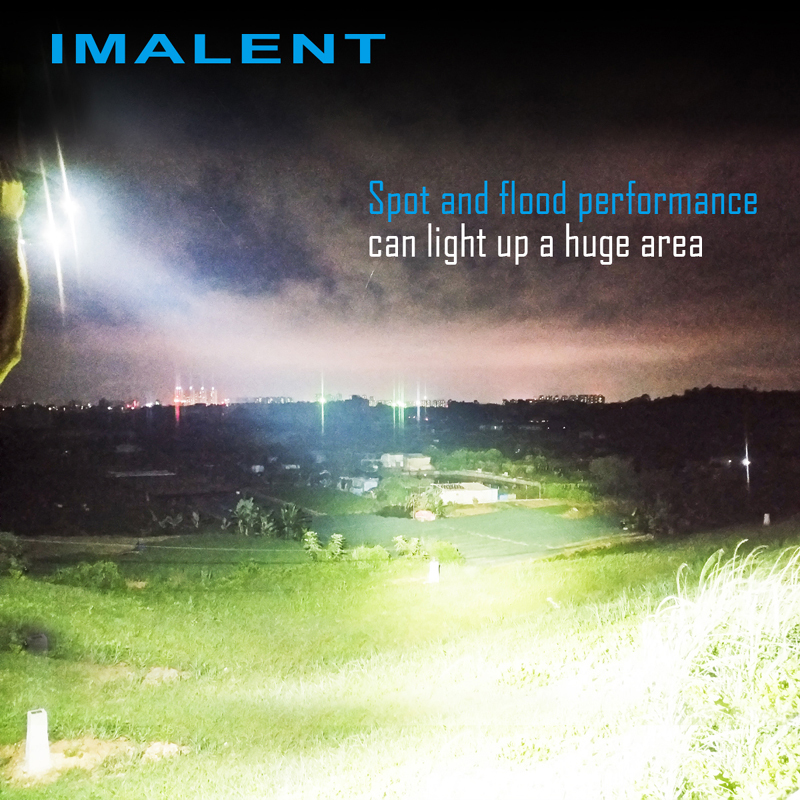 The “hide strobe” feature keeps you safe by starting quickly at critical moments. 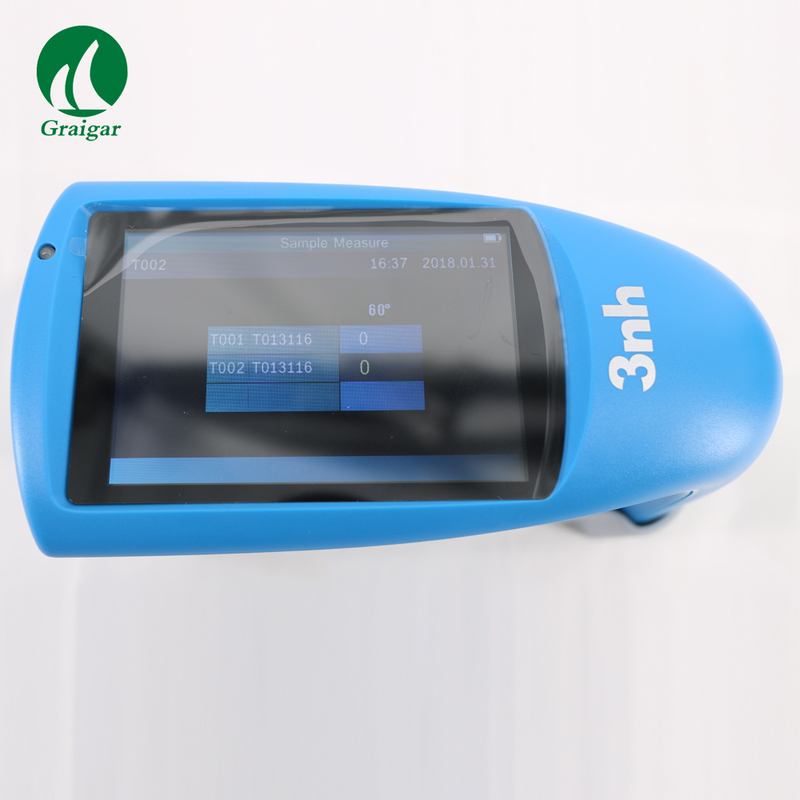 (2) Built-in safety self testing intelligent charging circuit, convenient, fast and safe. (3) Eight levels which can be exchanged quickly and instant Turbo. switch button will save the needed output level. 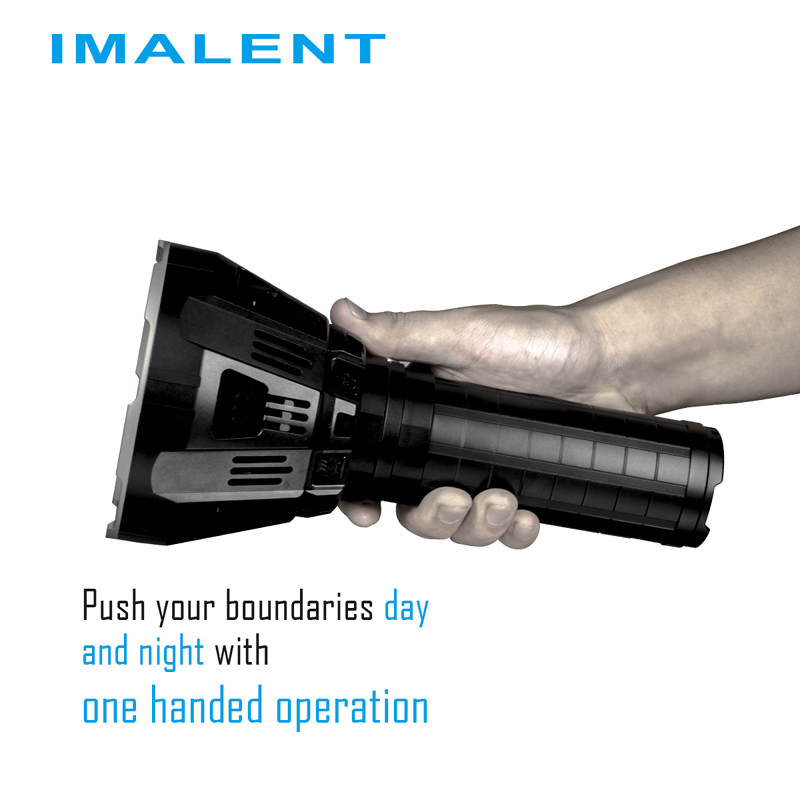 activate strobe, slightly press the power switch button to exit. 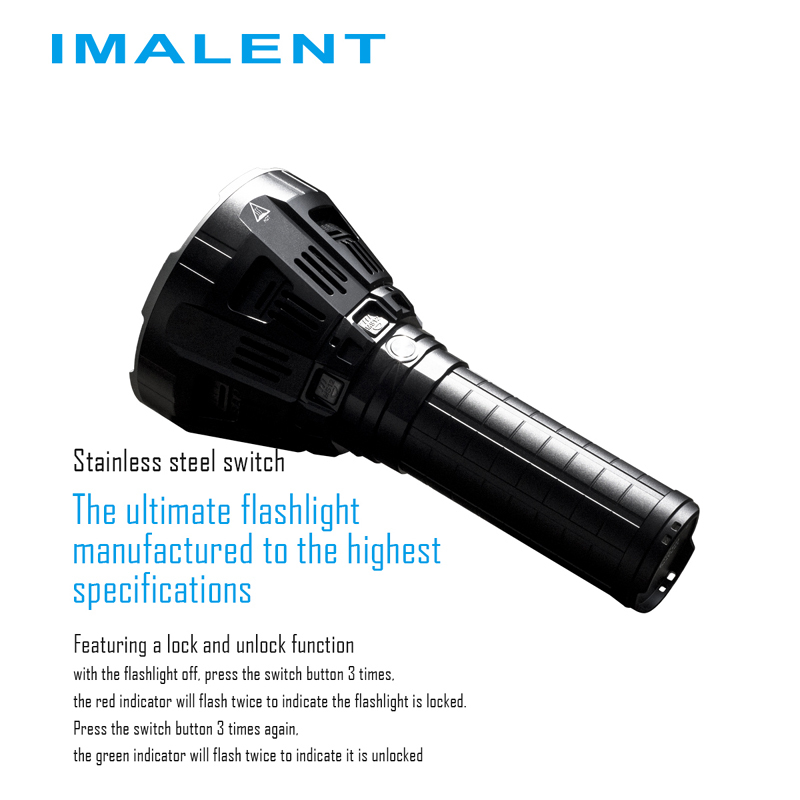 With the flashlight off, press and hold the switch button for one second to turn on the side lights. 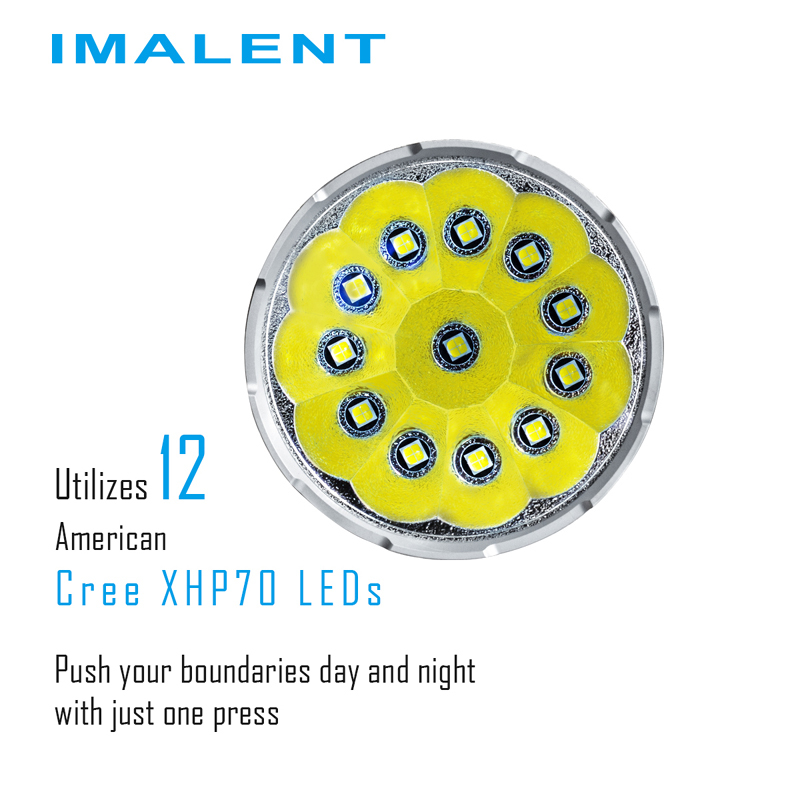 With the side lights on, slightly press the button to change output levels, high-medium-low. 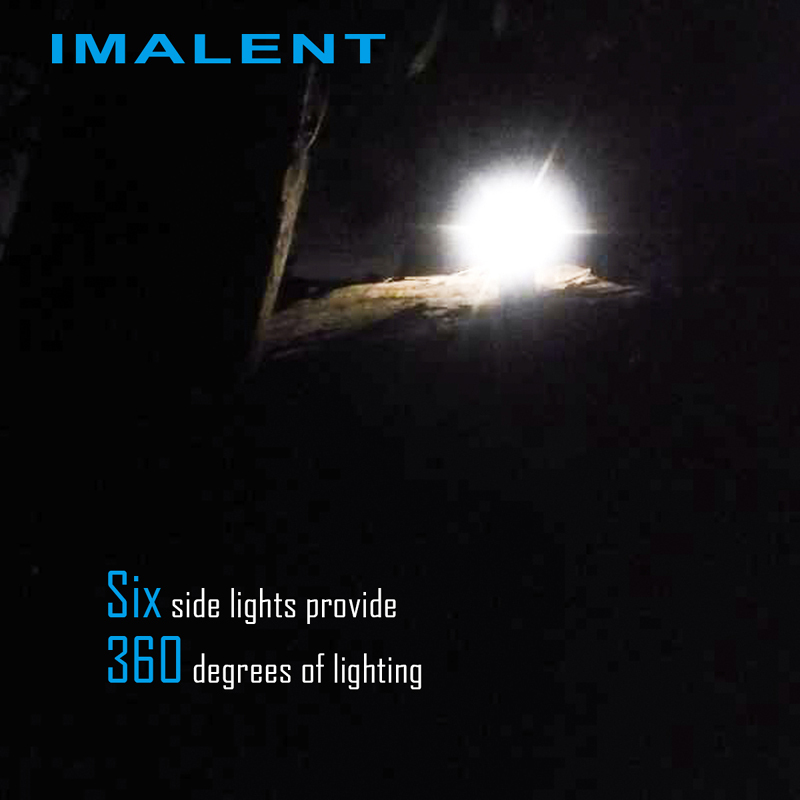 Press and hold it for one second again to quit side lights mode. 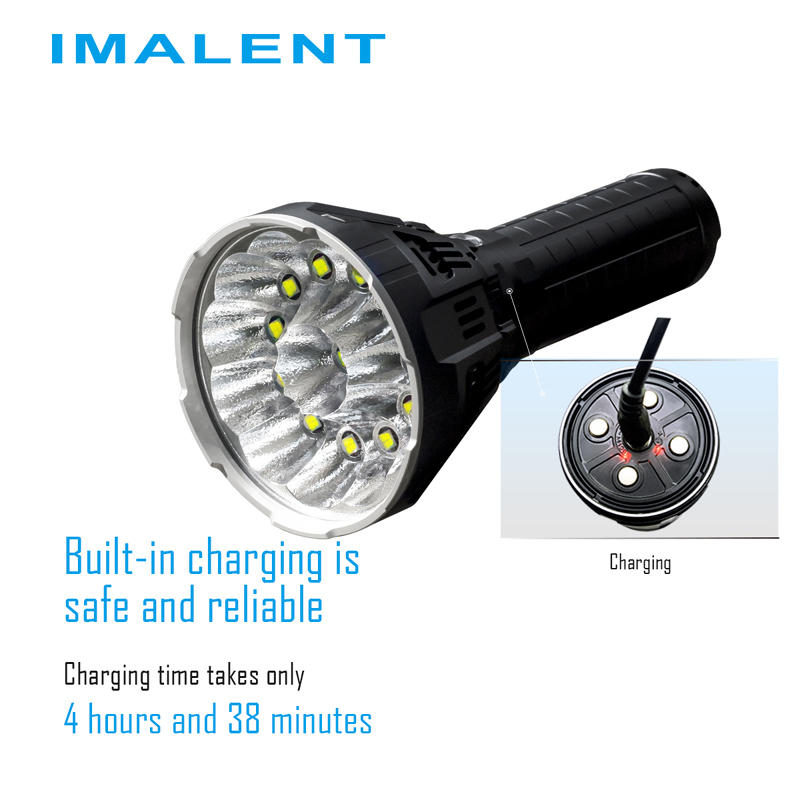 constantly to remind users to replace the battery or charge it. 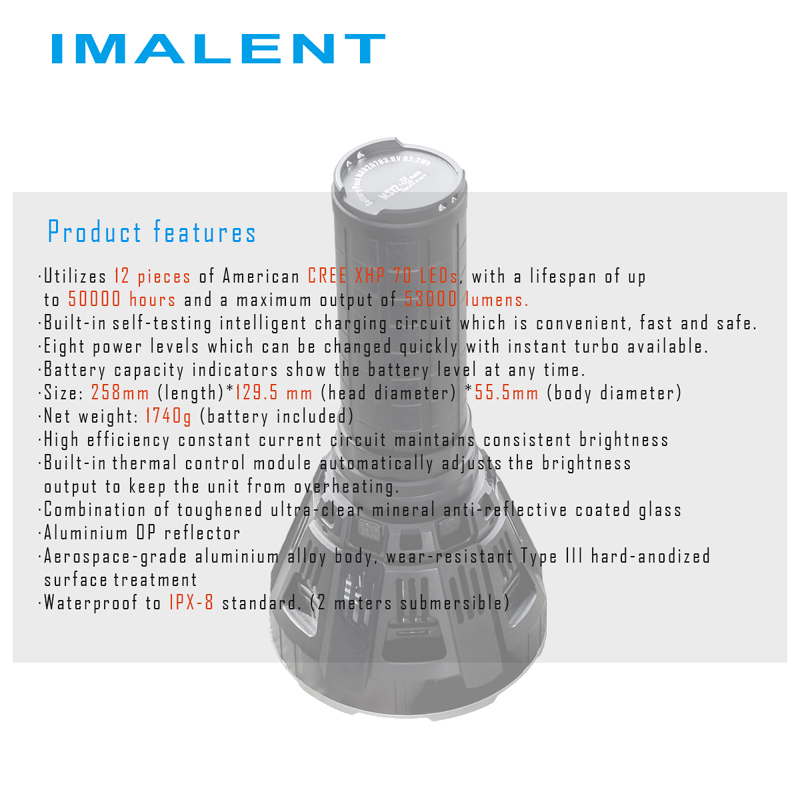 comfortable use and prevent discomfort from overheating. green indicator will flash twice to indicate it unlocked, and can work normally. 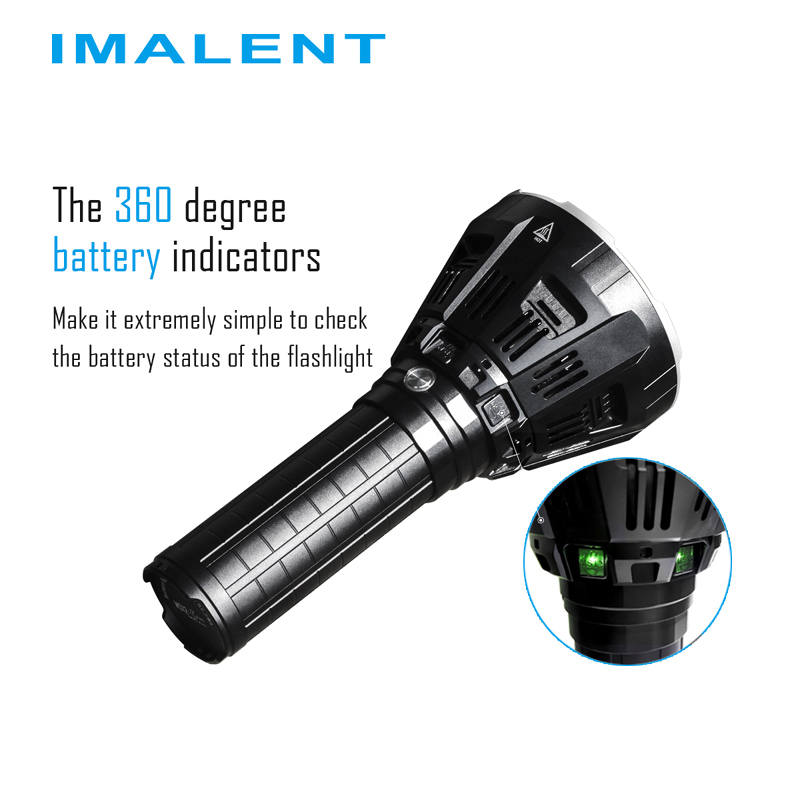 once the flashlights body reaches 55 degrees C.
cooling fan in order to cool off the flashlight. 3. 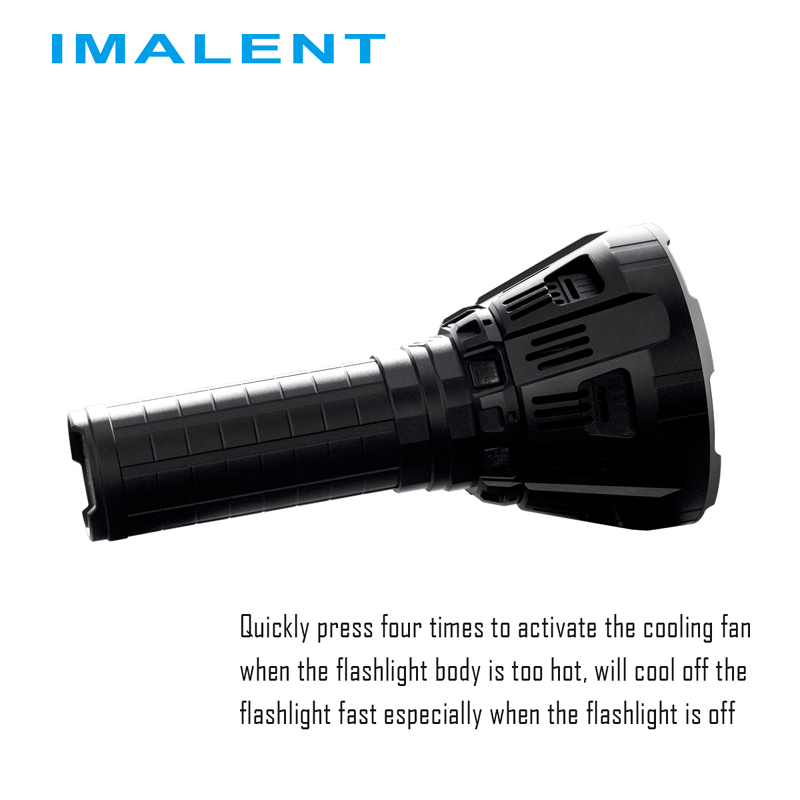 When under 15,000 lumens of output, the cooling fan will not turn on. As shown in Picture 1, the contact points of the positive and negative poles of the flashlight body are all in the same plane, and the plane must not be inverted on the conductor, otherwise the circuit board will be short-circuited. Every 6 months, the inner threads should be wiped with a clean cloth followed by a thin coating of silicon-based lubricant.